A 3-year old toddler was in a serious condition when a pen cap got stuck in his windpipe leading to cardiac arrest and miraculously survived after a major surgery, at a city hospital Pediatric Intensive Care Unit (PICU) recently. On January 2 last, Rangpal (name changed on request) was playing with his sister at home near Thimpu, in Bhutan. Rangpal was completely unaware of any danger of playing with his father’s pen in his mouth and the pen cap got stuck in his windpipe (Trachea) choking him, when he accidentally swallowed it, the doctors of the Medica Superspecialty Hospital on Wednesday said. He turned blue, limp and unconscious and was immediately rushed to the state government hospital in the neighborhood. He was required to be put on a ventilator there and various attempts to take out the pen cap failed by the team of doctors. The child went into cardiac arrest from which he was eventually revived. 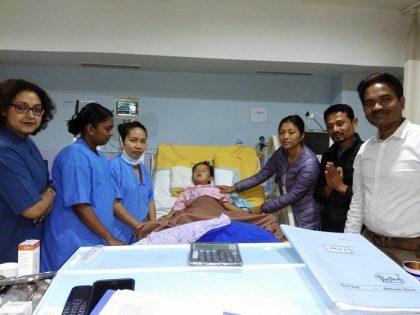 That’s when they had decided to airlift (by Air Ambulance) the toddler to a city hospital in Kolkata, given the location proximity and faith-the patients from the South Asian Association for Regional Cooperation (SAARC) countries endow on Kolkata doctors and hospitals. He suffered cardiac arrest twice in the air ambulance before being successfully transferred to the emergency unit of a private hospital in Kolkata. When he was admitted at PICU, he was unconscious. Dr Ashok Mittal, Senior Consultant & Head of Paediatrics and Neonatology, Medica Superspecialty Hospital, said, “He was in a complete state of shock and was struggling on a ventilator. After stabilizing him in PICU, he was shifted to the operation theatre (OT). Even here we couldn’t take it out with a Rigid Bronchoscope, as it was so slippery and was deeply embedded into his bronchus (windpipe). Rigid bronchoscopes are used in diagnostic and therapeutic procedures for a wide range of indications in the bronchial system, particularly in the case of removing foreign bodies from the windpipe.”Finally, the last resort was a high risk major open chest surgery,” said Dr Anindya Chattopdhyaya, Consultant Paediatric Surgeon. following day,” said Dr. Samuel Vaddeswaram, Consultant-Paediatric Intensivist. Acute Respiratory Distress Syndrome (ARDS) makes lungs ineffective, resulting in carbon di-oxide (CO2) accumulation and death. The Paediatrics team felt very joyous seeing the complete recovery of the child with foreign body in the airway, and having undergone multiple cardiac arrests followed by an open chest surgery. Dr Mittal further said that the critical nature of windpipe being blocked with a foreign body and safety concerns of the child who was airlifted in a moribund state after suffering recurrent cardiac arrests among other health conditions were difficult to address altogether. “It was a heart-stopping moment when we saw our little boy playing outside with his elder sister suddenly turned limp and unconscious. I got such a fright. I lifted Rangpal and did back slaps, then chest presses, then another round of back slaps but the cap of my blue pen did not come out. My son was wreathing in pain…It seemed I might lose my heart any moment,” said Wangmo Dorji- mother of Rangpal. “We were helpless and did not understand what to do so that the pain of my son subsided fast. We prayed and prayed as our son lay dying before us. Rangpal was wheeled into the OT in front of our eyes to undergo a complicated surgery. It was appalling to see my child lying unconscious for days. Infants and toddlers (less than 3-years of age) should never be allowed to play with small metal or plastic objects, nuts and other toys with choking hazards, however harmless they may look, as these small objects sometimes prove to be life-threatening, opined the team of doctors. “To minimize choking hazards in small children, we recommend parents to keep hazardous objects out of reach. Common household items that might pose a choking hazard include button, coins, batteries, peanuts, peas, and pen caps among others. Prevention is the Best cure. It may save a life!” concluded the doctors.